Stella came to us from the streets with her sister Masie. Masie died soon after. 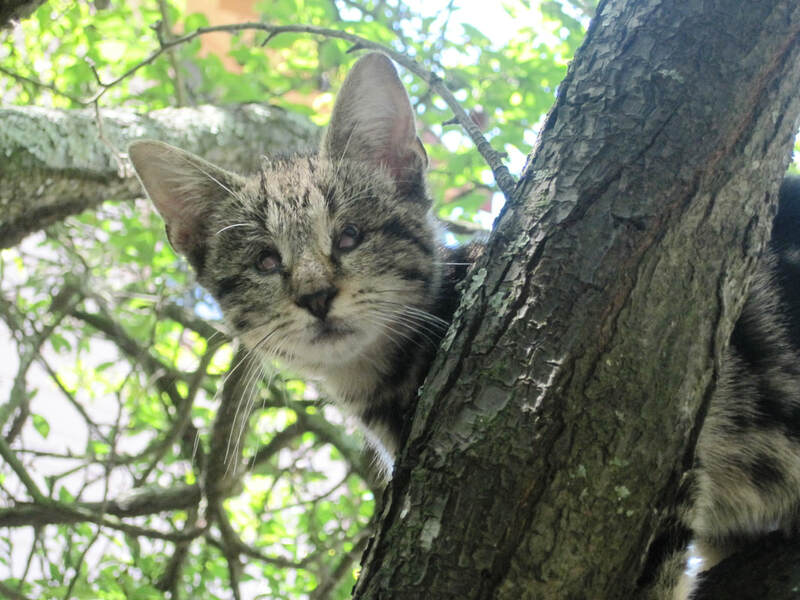 When kittens are born with deformed eyes, chances are that the brain adjacent may also be improperly developed. Masie had a couple of good weeks with her sister, and died quickly and quietly, bless her. Stella's eyes could pick up a bit of light, which made it possible for her to climb trees...but they were problematic, and the eye specialist said after several visits, that her vision was next to nothing now, and that the dangers of infection etc. were great. So after getting two other opinions, all the same, her little eyes came out. She had lost what small vision she had gradually, so was able to navigate splendidly. She just didn't climb trees anymore, and stayed in the back yard exclusively. They know their limits!! She was never completely well, however. One blood panel left two doctors thinking she'd be gone in days, but she lived months after those predictions. Stella had a strong, confident personality, and loved her short life as much as we loved her!